If you are the least bit intuitive, you know when something is not right with your dog. It might be subtle, but the slightest change in behavior puts you on guard. Yeast infections in dogs aren’t always easy to detect in the early stages. Today, I’m going to give you the scoop on what to look for in case you think your dog might have a yeast infection and exactly what you can do about it. Medication used to treat diabetes or Addison’s disease can leave the dog’s immune system compromised, and the weakened immune system leaves the dog unable to fight the invasion of fungi. Some fungi affect only the skin or mucous membranes. Examples include things like parasites (ringworm in particular) or thrush. Systemic fungi are widespread within the body and affect the organs. This strain of yeast infection, considered “subclinical”, means that the initial symptoms could be too subtle to notice or treat. In fact, you might think your dog has a cold/mild respiratory infection. This fungus originates in the Central United States near the Great Lakes, Appalachian Mountains, Texas and the valleys of the Mississippi, Ohio, and Missouri rivers. The soil in these areas is nitrogen rich, where fungus easily grows. Spores are found in soil contaminated by the excrement of wildlife and are inhaled unknowingly by people and dogs. This type of fungus is the most severe. The spores thrive in the dry, dusty plains of southwestern United States including California. Humans and dogs can contract the fungus from inhaling spores. Dogs with this usually develop a chronic cough. Treatment is available, but a full recovery could take a year. Let me tell you a true story about this one. I live in a small town where an elderly poet lived with a flock of seagulls. They were everywhere and made a mess of droppings on people’s homes and cars. Nobody would ever have dared go into the man’s house, because that’s where most of the seagulls resided. Years went by and finally, he was ordered out. The poor man was deathly sick…all because of the spores inhaled from the bird droppings. I’m pretty sure he passed away shortly after. Cryptococcosis in dogs (and humans) involves the brain, eyes, lymph nodes, and skin. Half of the dogs will show signs of breathing trouble. You’ll find this particular fungus along the eastern seaboard, Great Lakes, Mississippi, Ohio, and Missouri River valleys. This type of fungus thrives in moist, rotting organic debris. This is another fungi where spores from bird droppings are inhaled primarily by dogs. Blastomycosis involves the respiratory system and can cause serious pneumonia. This fungus inhabits the skin after physical contact with spores from the soil. These spores gain access through breaks in the skin. Hunting dogs are most prone to this particular fungus. Sporotrichosis shows itself as crusted sores that are nodular in shape. They’re usually at the base of the wound and ooze/drain. Diagnosis is determined with a fluorescent antibody test and treatment options are good. General Symptoms of Systemic Yeast Infections in Dogs. Other Symptoms of Yeast Infections. The biggest sign will be the appearance of your dog’s skin. Pink or red means the yeast infection is still in the early stages of infection. Could become thick and leathery signifies a chronic stage. People have all kinds of ways to describe the smell, but it is very distinct. Some yeast infections will lead to flakiness and crusting or scaling in the skin. Most yeast infections are found in the ears. If you notice your dog shaking his head or tilting his head more than the usual, you should check his ears. Your dog will seek comfort so they will be scratching and licking the infected area and sometimes rub up against other surfaces or scoot along the floor to deal with the itch. Yeast infection in the mouth can cause excessive drooling and oral discomfort. Treating Symptoms of Yeast Infections in Dogs. Treatment for yeast infections will depend on the location of the infected area, the severity of the infection, the underlying cause behind the yeast overgrowth, and the type of yeast. Yeast infections due to allergies will involve a plan to remove the allergens from the food, home, sleeping area, etc. Yeast infections caused by certain prescriptions or vaccinations can be eliminated by switching pills or brands and eliminating the use of vaccinations where possible. Topical ointments are prescribed for yeast infections on the skin. These ointments combined with prescribed baths are effective.Yeast infections in the ears are treated with drops. If the infection is internal or starts in the gut, you should consider your dog’s diet. Poor nutrition could also cause a weakened immune system, leaving your dog vulnerable to various infections. If you see these on the label, consider switching to a healthier brand. Some dog owners have started putting their dogs on a raw food diet, which is reported to help alleviate the itching and scratching that is associated with yeast infection. Treating a Yeast Infection at Home. You can use apple cider vinegar to treat yeast infection. Simply dilute the vinegar in water and massage the mixture all over your dog’s body. Be careful to avoid your dog’s eyes and nose. The vinegar will restore your dog’s pH levels and discourage further yeast growth. Keep in mind that the apple cider vinegar must be organic, unfiltered, and raw in order to get the best results. Coconut oil is comprised of medium-chain triglycerides which are composed of caprylic, lauric, myristic, and palmitic acids. Together, they give coconut oil strong antifungal properties, making it an ideal home remedy for yeast infections in dogs. Mix about 8 oz. of melted extra virgin coconut oil with 10 drops of lavender oil and 2 drops of lemon essential oil. Shake the mixture and massage all over your dog’s skin. Turmeric could have anti-inflammatory and anti-fungal properties that can help your dog deal with the itchiness and at the same time, help heal the infected area. All you have to do is sprinkle the turmeric powder on the infected area. Adding baking soda to your pet’s drinking water can help eradicate the yeast infection and helps with the balance of bacteria in your dog’s system. Baking soda is also said to have a neutralizing effect on the whole body. All you have to do is add 1 teaspoon of baking soda to 1 liter of water. ALWAYS CONSULT YOUR VETERINARIAN BEFORE LIMITING TREATMENT TO ANY OF THESE DIY OPTIONS. Treating Yeast Infections with Probiotics. The most vital supplement that you can get for your dog in the midst of a yeast infection is probiotics. 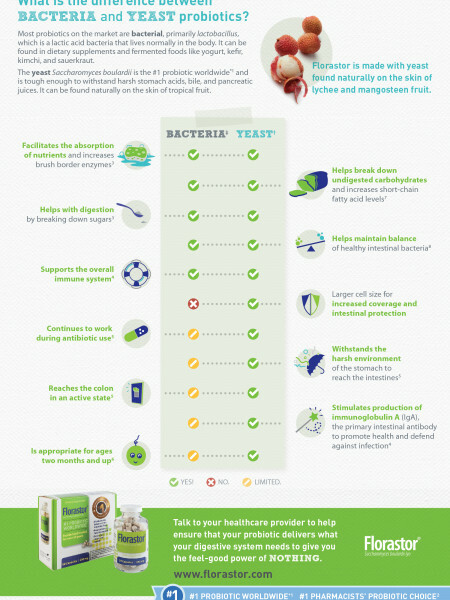 Probiotics are “good” bacteria that will provide a natural defense against not only yeast but other bad bacteria as well. Buy probiotic supplements made for dogs. The best strains for yeast are L. acidophilus, L. rhamnosus, and B. bifidum. Look for supplements that contain prebiotics along with probiotics. It is best to get probiotics in powdered form. Probiotics that come in the form of food and treats are not as effective because the heat used to process them destroys the probiotic. Yeast infections can become quite serious. Once you notice your dog is suffering, make an appointment to see the veterinarian. If your dog has a yeast infection, always follow your veterinarian’s prescriptions and instructions. Do not stop treatment until the veterinarian tells you to do so – even if you think the symptoms are improving or gone. Was this helpful? Please take a second to hit the share button so that other dog-owners are able to benefit!